Guinan advises Picard The High Priestess exemplifies wisdom. She is also known as "The Papess", after Pope Joan; other traditions have known this archetype as Sophia, Goddess of Wisdom. 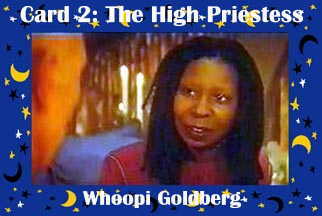 Whoopi Goldberg's High Priestess persona is most apparent as Guinan in STNG; however she is consistently type-cast as a wise, resourceful woman who is inevitably underestimated by the men in suits who are her foes. Guinan and Picard are from The Patrick Stewart Page, a German page. Go here if you want to hear a German-dubbed Guinan explain to Picard why the Nexis is like a drug (be prepared to wait a long time for the film to upload).